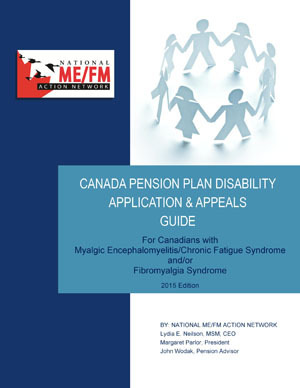 The National ME/FM Action Network is pleased to provide you with the latest edition of our Canada Pension Plan (CPP) Disability Guide. Here is additional material related to the CPP-Disability program. Government employees who review CPP-D applications are provided with documents to guide their work. An evaluation of the CPP-Disability program was released in August 2011 and can be found here: http://www.esdc.gc.ca/eng/publications/evaluations/income/2011/january.shtml. The following are some of the findings. Note that the analysis excludes Quebec which has a separate plan (QPP). Only about two-thirds of working-age Canadians have CPP-D coverage. It is hard to qualify for CPP-D, with the approval rate at the initial stage of adjudication averaging only 45%. In 2005, 295k Canadians were receiving CPP-D benefits . Despite the fact that CPP-D is supposed to be only one element of income support, 12% of CPP-D recipients in a survey said that these payment was their sole source of family income. The maximum CPP-D payment in 2005 was $12,123 and the average payment was $10,390.The LICO (low-income cut-off) in 2005 was $14,303 for a single person living in a rural area and $20,778 for a single person living in a large city. 60% of a sample of applicants that were denied CPP-D had not returned to gainful employment during a three to four year period following denial, suggesting that many people who are denied payments could be genuinely disabled and incorrectly denied coverage. CPP-D was not as large a disincentive to work as had been previously assumed. Network representatives met with CPP-D program officials in January 2012. Here are notes of that meeting.